2. Bring forward any outstanding balances from suppliers' accounts from the previous accounting system upon adopting EMP for the first time. Supplier Invoice for Trade Supplier is AUTOMATICALLY created by the system when you create GRN, either from Trading -> Direct Receiving Stock, Procurement -> Create GRN by PO or Trading -> Intercompany Stock Transfer. 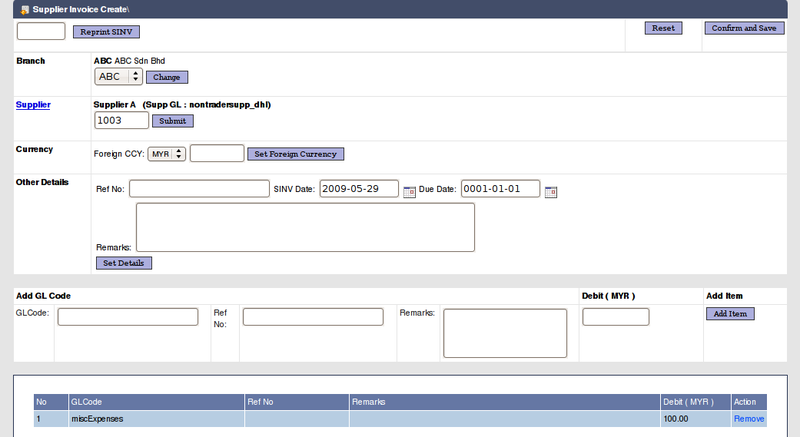 On the other hand, this feature is created to allow user to create Supplier Invoice for Non-Trader Supplier. 1 Branch Supplier Invoice Branch. By default is user's Default Branch. 3 Currency The Supplier Invoice created can be in any other currencies. 5 Other Details : Remarks User can put in a brief description about the Supplier Invoice. 11 Add GL Code : Debit This is the amount to be Debited to the GL Code. Please note that the amount specified has to be bigger than RM0. Please note that this feature is guarded by permission. The permission can be configured in System Admin -> Role Permissions -> Supplier -> Supplier Invoice Create. To make Payment for Non-Trade Supplier Invoice, is no difference from making payment for Trade Supplier Invoice, you can either pay using Payment Voucher or Contra with Credit Memo.